The first race of the gold fleet finals at the 470 Junior European Championship didn’t start well for Sofian Bouvet and Jeremie Mion, but as the old saying goes, it’s not how you start but how you finish. 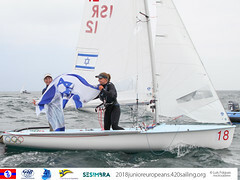 The reigning 470 Junior World Champions were lying deep in the 31-boat gold fleet around the first windward mark, with the wind blowing a shifty force 2 from the western end of Lake Balaton in Hungary. The French bounced back to 5th in that race, while their closest rivals in the overall standings, the German team Ferdinand GERZ and Tobias BOLDUAN slipped from 1st to 3rd just before the finish. “We were leading until the last run, and the wind was shifty and gusty and we didn’t see them very well - I don’t know why,” said GERZ. “We had problems with the start today, always bad starts, all three races. I think we were just stupid. Tomorrow we will be smart, enough of stupid.” Yannick BRAUCHLI and Romuald HAUSSER (SUI) pounced on the Germans on the last run and took the winner’s gun. In the women’s championship, Viktoria JURCZOK and Josephine BACH continue to lead and now hold a 20-point advantage over another German crew, Annika BOCHMANN and Anika LORENZ, the defending champions. The gold fleet completed their three scheduled races, but the silver and bronze divisions were not so fortunate, suffering two abandonments and only completing one heat. 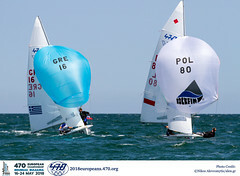 Botond SZIGETHI and Joo KRISTOF dominated the silver fleet race to score a victory for Hungary, but it is the Italians Paolo CATTANEO and Vittorio ZAOLI who lead from the Swiss sisters Stéphanie and Romy HASLER. This team has not raced together before and XINTARAKOU said it was very different sailing with a boy rather than another girl. “We don’t have much to say to each other. We just talk about racing, nothing else. So the boat is quieter than when we sail two girls together.” It’s a formula that seems to be working for them. 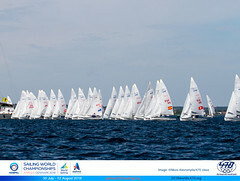 Denys KALCHENKO and Andrii SVYRYDOV from the Ukraine lead the bronze fleet, although only by 3 points, with many races yet to be sailed.